Preheat the oven to 180°C/350°F. Line a large baking sheet with baking paper. Place ½ cup of the oats in a food processor and process until finely ground. In the bowl of an electric mixer fitted with the paddle attachment whisk together the oat flour, remaining ½ cup oats, all purpose flour, brown sugar, baking powder, baking soda, cinnamon and salt. In a separate bowl, whisk together the eggs, molasses, oil and vanilla. With the mixer on low speed slowly add the egg mixture to the dry ingredients, scraping down the sides of the bowl as necessary. Mix until combined. Mix in the pecans and apricots – dough will be stiff. Turn out the dough onto a lightly floured surface and divide it in half. Shape each portion into a 40x5cm (16x2in) log and transfer them to the prepared baking sheet, 7.5cm (3in) apart. Bake until the logs are golden and firm to touch, about 30 minutes. Transfer the logs, still on the parchment paper, to a wire rack and cool for 10 minutes. Reduce the oven temperature to 150°C/300°F and line two baking sheets with baking paper. With a serrated knife, slice the logs on the diagonal into 8mm (1/3in) thick slices. Place the biscotti slices onto the prepared sheets 2.5cm (1in) apart and bake until they are dry and firm to touch, about 40 minutes. Cool completely on the sheets over a wire rack. Biscotti can be kept in an airtight container at room temperature for up to 1 month. I love my favorite breakfast in a no-sweat, non messy package. Thanks for sharing this posT! Beautiful biscotti! I imagine they have a wonderful flavor & texture from the molasses, pecans, and apricots. 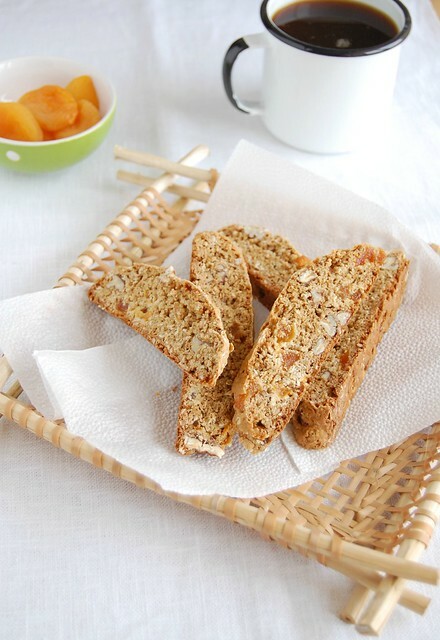 I like the idea of using oats in biscotti! Definitely gonna try it. Thanks for the recipe! I love oatmeal and I love biscotti, so I was eager to try this recipe. Very disappointing though. For one thing, mine came out too dark and tasted too strongly of molasses. If I made these again I'd try light molasses or perhaps agave, but I don't think I'll try them again - they were too ho hum. I love your blog - glad I found it!